Autism Society Philippines (ASP) - Tagbilaran Chapter, a first of its kind in Bohol, was formally launched on December 30, 2016 at Reyna’s Haven and Garden in Tagbilaran City. The ASP-Tagbilaran Chapter founding officers, inducted by Barangay Cogon Chairman Nicanor Besas, are: Darlene Sangueza-Cano, President; Luis Lanzaderas, Vice President; Mildred Patac, Secretary; Cherry May Odal, Treasurer; Angelita Ayco, Auditor; Ana Marie Dajao and Marites Siga, Press Relation Officers; and Teodoro Dano, Jr. and Alex Oclarit, Sergeants-at-Arms. A short talk on autism awareness, ASP and empowerment of autism parents by ASP Trustee and founding member Ms. Cecil Sicam highlighted the launching event aptly themed ‘Hope for Autism’. The half-day event was also fellowship of sorts where autism parents took turns sharing their personal experiences about having a child with autism spectrum disorder. Initiated by therapy centers in the city the Building Bridges Therapy Center led Ms. Muffy Lucas, BrainGate Developmental School led by Ms. MaJo Ann P. Alagcan, Stimulation and Therapeutic Activity Center (STAC) Bohol led by Mr. Gligen F. Nistal, ASP-Tagbilaran starts with a small but strong group of 23 autism parents, therapists, and friends of autism. 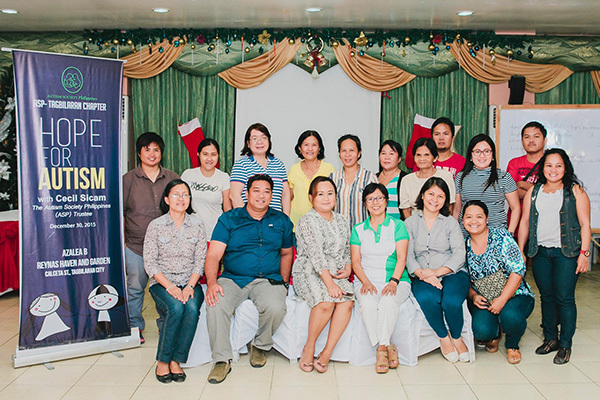 ASP-Tagbilaran is a beacon of hope not only for better understanding on autism and improved well-being of persons with autism and their families, but also for improved education on and services for developmental disabilities in Bohol, in general.